This work is accompanied by an authenticity certificate signed by André Schoeller and dated 11 July 2006. The harbinger of Art Informel, and exponent of one of the strongest, if most private, French responses to Abstract Expressionism, Jean Fautrier stands out as one of the most original figures of Twentieth Century art. Largely forgotten after his death in 1964 – only four years after having won the Grand Prize for Painting at the Venice Biennale – he has recently been the subject of much critical attention, culminating in the great retrospective at the Musée d’Art Moderne de la Ville de Paris (January-May 2018), and highlighted by a renewed interest from French and international collectors alike. His constant experimenting with form and texture, his emphasis on materials over representation (evident in the smeared surfaces of his canvases and thick impastos) deeply influenced contemporaries such as Jean Dubuffet and Anton Tapiès. Fautrier’s extensive career, spanning over four decades, saw the artist often returning to themes and techniques at distance of several years, always independently of the current vogue. His early move from Expressionism to “abstraction” led to highly idiosyncratic results, ones were constant traits were however clearly delineated from the late 1920s. The preference accorded to the metaphorical gesture, the experimentation with materials, the sparing use of colour which often barely streaks a subdued background, and the central placement of the subject matter on the medium. Compare it, for instance, with Son petit Coeur (nu) from 1963 (see below, fig. 5). His artistic stance was perhaps best defined by his friend and modernist poet Giuseppe Ungaretti, according to whom Fautrier “replaced the imitation of nature with the ‘lively life of nature’, with ‘unforgettable new special coincidences of nature itself” (Schwarz, op. cit., p. 18), where “nature” is taken to include the human form and, most cogently, human emotions which, as such, cannot be “viewed literally” but require a symbolic interpretation (idem, p. 19). Like Mondrian, Fautrier arrives to abstraction through nature, whilst often keeping a foot in the figurative – as his works’ titles often betray. From around 1955, Fautrier retraced his steps to canvases of the late 1920s, producing highly abstract compositions, often using a mixture of tempera and oil applied on a background of thick, mixed media impasto that, in works on paper, is substituted by a gouache preparation. The process included placing a sheet of paper horizontally on the large table in his studio, which, having previously been laid on canvas, was later heavily covered with oil colour and a variety of pigments, applied with swift movements. Such “motions” (it is almost a contradiction to talk of “brush strokes” with Fautrier) evoke natural spiralling shapes, but also bring to mind the work of Cy Twombly, Jean Dubuffet and Anton Tapiès, albeit their reason and appearance are more organic and emotive than cerebral. It is indeed disconcerting to look back at a canvas such as “Les Arbres” from 1928 (see above, fig. 2), which virtually predates by a quarter of a century the achievements of the above-mentioned painters. As proof of Fautrier’s constant retracing his own footsteps, compare it with Green Trees (1958, Private Collection; fig. 4). Misleadingly evocative of automatic writing, such gestures are echoed in a number of paintings from the same period, where the painterly matter is normally concentrated in the centre of the canvas, as again in ‘Son petit Coeur (nu)’ from 1963 (fig. 5). Indeed, in his own solitary path, Fautrier seems to have reached – sometimes, anticipated – some of the conclusions of his other contemporaries. For example, his approach to the painterly surface cannot but recall the Twombly of Ferragosto (1961) and Nine Discourses on Commodus (1963; fig. 6) or later drawings from the late 1970s and early 1980s such as Nimphidia (1981), which share with the present work impulsive smudges of pigment on a background comparatively devoid of subject matter. Moreover, the spiralling, swirling movements compare well with Twombly’s Blackboard series. However, while Twombly’s work was profoundly entrenched in the written and literary world, the doodles and ‘scribbling’ recalling myths and texts that went deep into the soul and roots of the Western world, Fautrier’s appear as either the mere gestural tracing of a memory, a sentiment; rather than visual, they are metaphorical: the chronicling of a feeling. 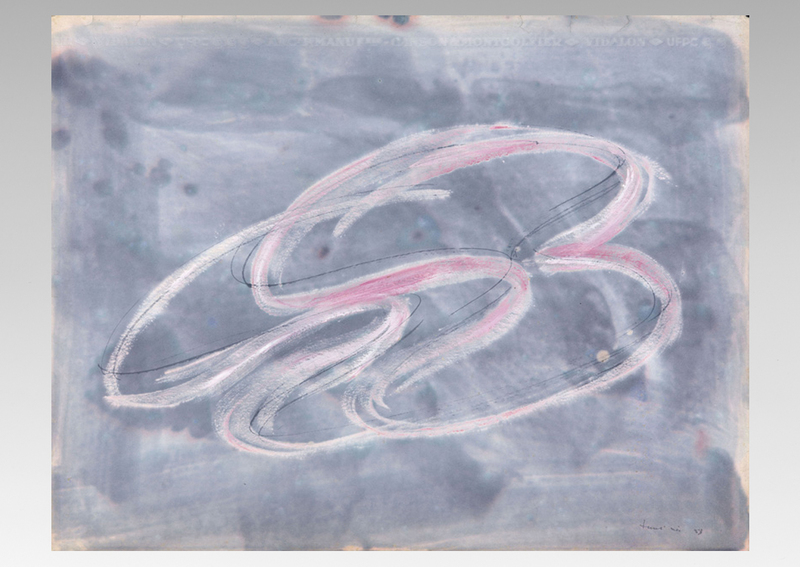 The artists’ tracing of such ‘scribbles’ – so similar on the surface – had diametrically opposed origins: the long shadows of automatic writing for Twombly during WWII, the abstraction from a visual reality, i.e. that of trees, which started in the late 1920s. The present work is one of the largest and most vibrant in a series of which several examples are now in the collection of the Musée d’Art Moderne de la Ville de Paris (fig. 7), all created by the artist between 1958-1963 on what is arguably his favourite medium, papier buvard, or blotting paper. These are characteristic of Fautrier’s oeuvre in their sharing a common-ground gouache preparation in muted tones of grey, on which the painter’s gesture of spiralling forms is applied. The pink matière – usually tempera with oil colour accents – would appear to relate them to a contemporary series of abstract nudes, where the same pink, laid with swift and powerful strokes, is deployed to evoke the contours of a feminine shape, or the lost memory of an encounter.